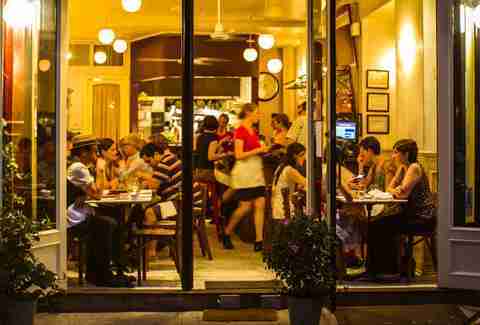 While we write about basically everywhere there is to eat and drink in our 37 cities, we sometimes tend to focus too heavily on what’s new, and what’s right NOW. The thing is, there are countless establishments around this great, hungry country that have been around for years and are still bringing it harder than ever -- places that deserve to be immortalized. And thus was born the Thrillist Hall of Fame, the place where they can live forever, even after some of them inevitably disappear. 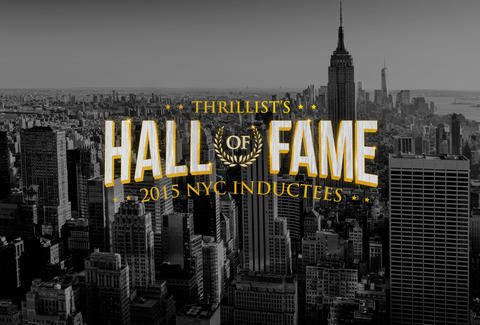 Every year, the Thrillist Hall of Fame will induct the most timeless, most impactful, and most important restaurants and bars currently open around the country. Chosen from a list of 60 nominees by a panel of NYC restaurant owners, bartenders, food writers, and more, our inaugural class is made up of 11 New York City establishments that mean as much to the city as one possibly could -- and they're just the start. We’ll be rolling into new cities before you know it (... unless you somehow accessed our calendar and know exactly when it’s going to happen, in which case, stop doing that please). Scroll down for the winners, and realize that if you live in or visit New York, and you haven’t checked all of them off your list, you’ve got work to do. One of the few constants about New York City -- aside from crowded subways, arm-and-a-leg rents, and that guy screaming outside your window -- is change. Back in the early days, Humm’s suckling pig dish was all the rage; I wanted that crispy lacquered pork so badly that I kept a lunch reservation the morning after fainting in the aisle on a flight from SF to NYC, and scratching up my face pretty badly in the process (those airplane carpets are rough). Wolverine cheeks or not, I was going to eat that goddamn pig. 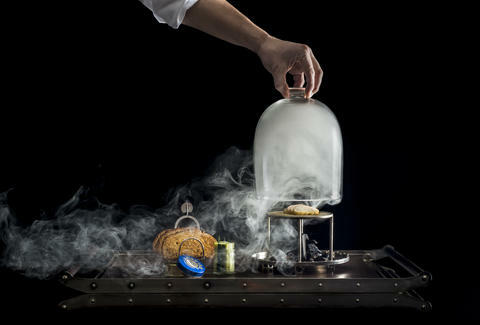 Since then, Humm hasn’t been afraid to mix things up on the restaurant’s fancypants tasting menu. He was an early adopter of the all-vegetable-menu front, launched a somewhat kitschy NYC history-centric tasting, and wrote a cookbook called (perhaps unsurprisingly) I Love New York along with front-of-house master Will Guidara. There’s always a perfectly balanced cocktail to be sipped, playful preparations to “ooh” and “ahh” over, and that gorgeous Art Deco architecture to ogle. And yet, the restaurant doesn’t take itself too seriously: note the raucous annual Derby party at which you can wear a stupid hat and get sloppy. Every time Humm changes things up, people pay attention, because he takes chances. And that’s why Eleven Madison Park matters. There are plenty of tasting menus to be had in New York City, but Humm’s creativity goes to, well, eleven. 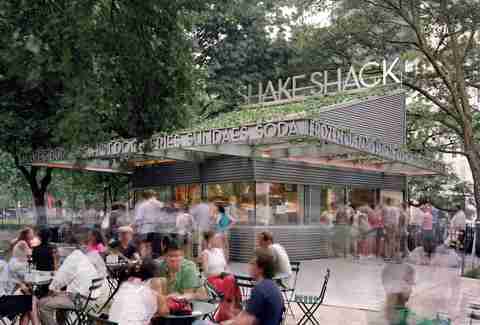 All of Danny Meyer's establishments, even the decidedly casual Shake Shack, exude reverence. 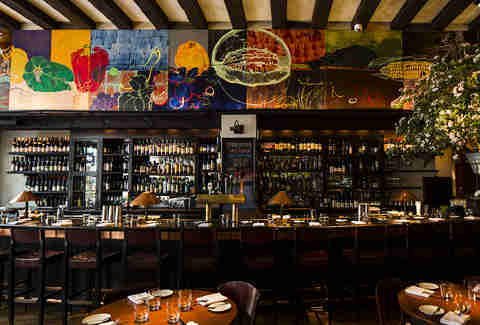 But Gramercy Tavern, which has held court in the Flatiron District for over 20 years, is especially hallowed territory. The words "seasonal" and "American" are constantly bandied about in today’s farmers market-propelled dining landscape. But executive chef/partner Michael Anthony’s cooking has long been the very embodiment of fresh and local, and there are two ways to savor it at Gramercy Tavern. 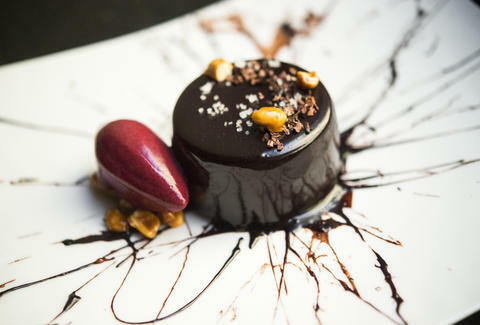 On those especially sophisticated date nights (or when forking over the corporate card is a possibility), there’s the hushed dining room, with its prix fixe menu flaunting artful arrangements of pistachio-bacon tagliatelle and cauliflower with smoked ricotta and bitter greens. For, say, a more run-of-the-mill Tuesday, that boisterous, timeless, namesake tavern beckons, where cocktails like the Church Key (Ransom Old Tom gin, Cocchi Americano, Yellow Chartreuse, lemon) are sipped before feasting on fish croquettes and jerk pork chops. Pastry chef Miro Uskokovic is no less talented on the dessert front, so confections like his Meyer lemon sundae with poppy seed cake are also well worth the caloric bender. That so many restaurants are now building their menus around shiny, just-plucked produce is a wonderful thing, but Gramercy Tavern, a pioneer in this realm, presents it best with unwavering grace. 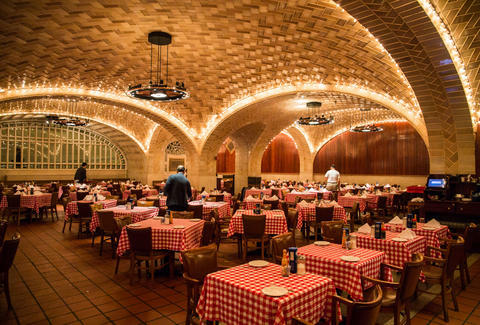 The best possible reason to miss a train in New York City is because you were sitting on a padded, metal-stemmed barstool, tucking into another plate of bivalves from under arched Guastavino tiled ceilings. 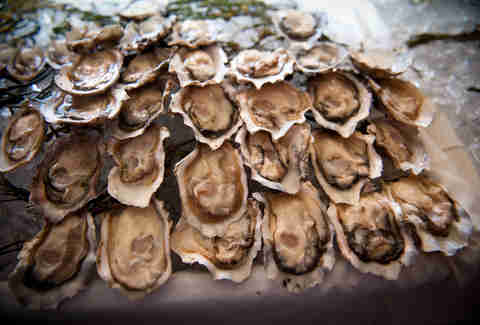 Grand Central Terminal opened in 1913; a few months after that, there were oysters. More than 100 years later, after millions and millions of commuters, business people, tourists, and people who just want oysters have filtered in and out, it still maintains an unmatched dignity. The oyster roster is deep and occasionally intimidating, and the creamy, absurdly rich oyster pan roast has been called New York’s greatest dish of all time by NY Mag’s Adam Platt. Calling the service brusque might be generous; calling it absolutely what you want when attempting to temporarily implant yourself in 1920 is just the truth. Can someone on the other side of the restaurant really hear you when you whisper under the front archway? That might be legend, and it might be true, but if the latter’s the case, the staff is probably pretty bored of hearing people whispering really, really nice things about the place all night. 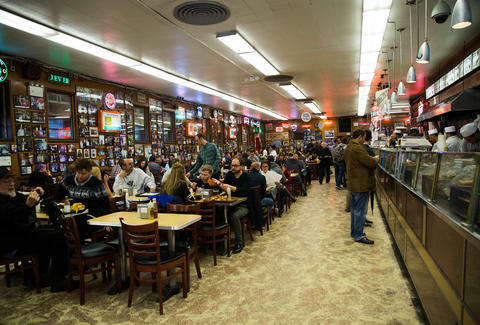 Of all the tourist-filled restaurants in New York, Katz’s is the one that still belongs to us. I lived around the corner for three years, and the line became part of my life. On Saturday and Sunday mornings, it wrapped around the block. Europeans, Midwesterners, Asians. Everyone. They came with food-tour guides, or with their families, or on their own, clutching maps and cameras. Their desires were all the same: they wanted meat, plus a picture of 1) the Meg Ryan booth, or, 2) the salami/boy in the Army sign. And yet, as long as you know when not to go, Katz’s is for you, whether you’re the kind of superfamousperson who gets his picture on the wall, or just some regular dude that's not as handsome as Pee-wee Herman. Spin through those turnstiles, take your ticket, OH GOD DON’T LOSE YOUR TICKET, order your mountain of pastrami or corned beef, take that sample the kindly man wielding the knife offers you even though you definitely don’t need any additional meat, sit down, consume like mad, and pray to your preferred deity that you don’t lose your goddamn ticket. I’ve gone to Katz’s with bucket-listing friends and relatives from out of town, with my roommate’s cousin that I barely know, and with my Mother, who only ever gets the Reuben. One night, for no reason at all, I spent maybe four hours at a back table with a couple of buddies, turning the place into our personal bar, drinking pitcher after pitcher, deconstructing sandwiches and picking off pieces of meat like they were bar peanuts, and, of course, panicking every 10 minutes that those tickets were gone. 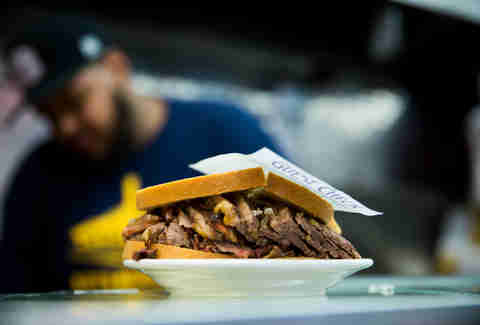 Katz’s was ours. 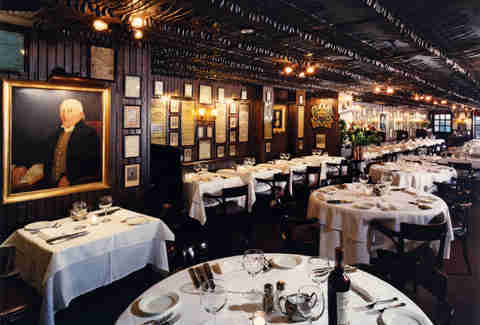 Of all the fabulous steakhouses in New York City, Keens is by far the best at which to eat a gigantic, primal mutton chop while sitting next to Babe Ruth’s pipe. Those spindly churchwarden pipes -- so named because they once allowed service-goers to sneak a smoke out of stained glass windows during a mass -- line the walls and ceilings of the hallowed meat cathedral, number over 50,000, and used to be held for tobacky-happy consumers like Teddy Roosevelt, Douglas MacArthur, Albert Einstein, JFK, and -- most prominently of all -- Rosie Perez. Bloomberg can ban smoking, but he can’t ban your ability to remember a time when John Starks did it right after he ate a chateaubriand for two, by himself. Of course it’s all about that meat, and it has been since 1885, that blessed time before anyone, especially Albert Keen, seemed to have heard about apostrophes. The apparent half-belly of bacon that rivals the lauded Luger’s offering. The dripping prime rib. 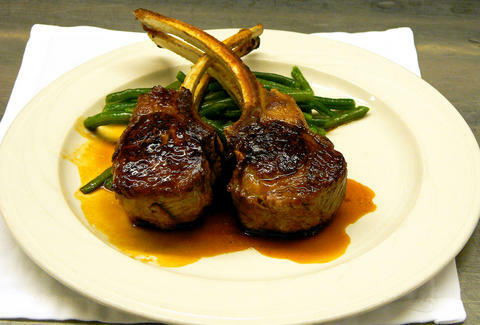 The mutton chop that may be the most iconic steakhouse item in the entire city. That hulking, triple-sauce-sided chateaubriand that, seriously, John Starks almost definitely eats by himself, because he’s John Starks, and can do stuff like that. 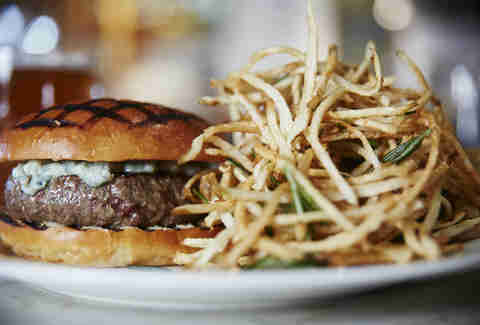 And hiding amidst all that flashier meat, over in the club room, is the burger. Born from steak trimmings and near-hidden by a blanket of cheddar, you might be able to fill a shot glass with its savory juices if you wrung it like a sponge. In a truly Ruthian line of thinking, if you’re eating meals like this, how much can a quick smoke hurt, right? 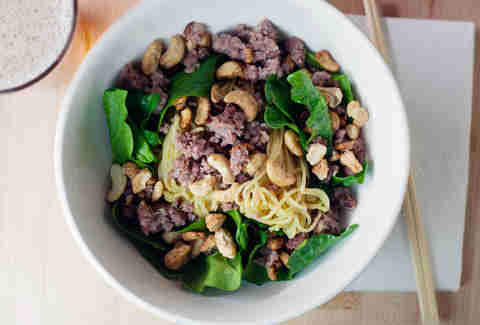 In 2004, before there was Ippudo, Totto, or Ganso, there was this East Village noodle joint, the first solo project of a scrappy young chef named David Chang. What started as a culinary rule-breaker’s homage to his favorite dorm room staple soon became ground zero for New York City’s ramen and pork bun explosion. Eleven years and countless imitators later, the OG noodle slinger still stands on top, thanks to its tradition-defying Momofuku Ramen, a rich, bacon-infused bowl capped with two cuts of pork (belly and shoulder), bamboo shoots, and poached egg. But more than the ramen makes Noodle Bar a game changer. It’s the restaurant’s highbrow-meets-lowbrow approach to cooking, along with the inventive riffs on both Asian and Southern specialties -- think chili-shellacked rice cakes, brisket buns with horseradish and pickled red onions, and, of course, the reservations-only fried chicken done two ways. 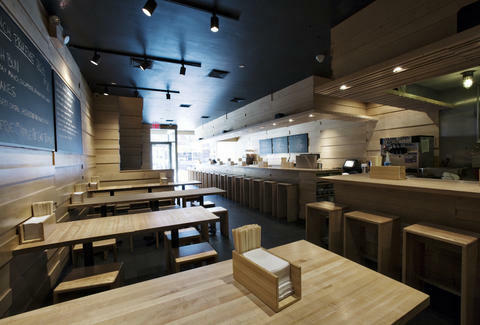 Noodle Bar has also become the jumping point for talented chefs like Kevin Pemoulie (Thirty Acres), Joaquin Baca (The Brooklyn Star) and Deuki Hong (Kang Ho Dong Baekjeong), expanding Momofuku’s reach far beyond its own peachy empire. And with Chang returning to his meat-between-two-buns roots with a forthcoming fried chicken sandwich joint, the lasting power of Momofuku Noodle Bar is more obvious than ever before. Before brunch became a rote parade of wan Mimosas and predictably overcooked poached eggs, it was a worthwhile reason to hightail it to Prune. It still is. The tiny East Village institution remains one of the city’s few haunts where queuing up for the de rigueur weekend ritual actually leads to true fulfillment. After all, there is a mammoth, Dutch-style pancake -- hot from the oven and dusted with powdered sugar -- to look forward to, as well as the eggs Benedict to end all eggs Benedict (don’t worry, that’s just a saying; eggs Benedict will never end) paired with blissfully crunchy potato rosti. And then, of course, the numerous, potent Bloody Marys that many consider to be the finest in the city (shout-out to the chipotle pepper-laden tequila spin). But what makes Prune, 15 years later, still so appealingly relevant amid a steady barrage of white-hot newcomers, is the tireless devotion of chef/owner Gabrielle Hamilton. New Yorkers have long loved her honesty and fearlessness just as much as her homey and adventurous food. Prune is where one seeks comfort in a rustic gumbo that mingles fried rabbit and snails, baked chicken liver cannelloni made all the richer by the presence of Béchamel sauce; and mascarpone ice cream strewn with salted caramel brioche croutons. 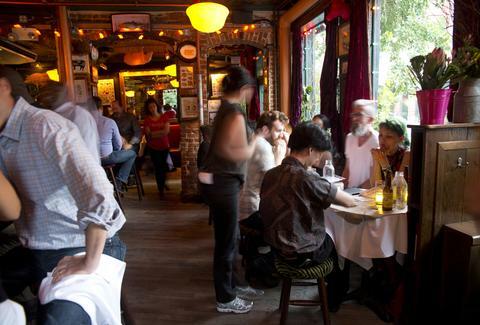 As the East Village increasingly becomes flashier, Hamilton’s dining room, all mirrors and charm, is a convivial reminder of a bohemian past. "The day I moved to Bushwick about 10 years ago, it was snowing, and the first thing I saw was this red balloon, floating amongst all the softly falling white snow, and I said, this is it. This is my new home. And it’s beautiful. And then I turned the corner and there was a car on fire. And I said, ahhh, this is my new home." In 2008, Roberta’s opened. Seven years later, the neighborhood has far fewer cars on fire, and far more restaurants. Both can at least partially be attributed to the not-that-little pizza place that could. 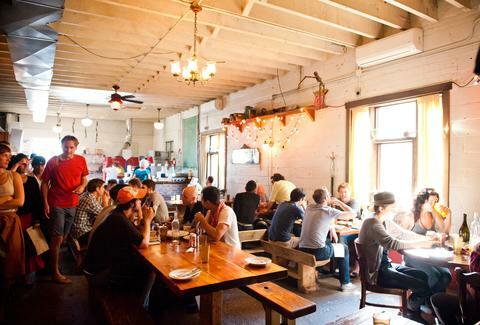 Roberta’s is, at this point, legitimately an icon, in the new-Brooklyn-iest sense possible: it’s wonderfully relaxed, and the staff has beards, both they and the patrons wear clothes that make you feel like you definitely need some cooler clothes, it’s home to a radio station, and everyone is just nice. That Tiki tent used to be a major party hub for the neighborhood; now there are bars galore, as Roberta’s very existence proved that opening one in Bushwick was not a completely insane idea. Of course, none of this happens without fantastic pizza. 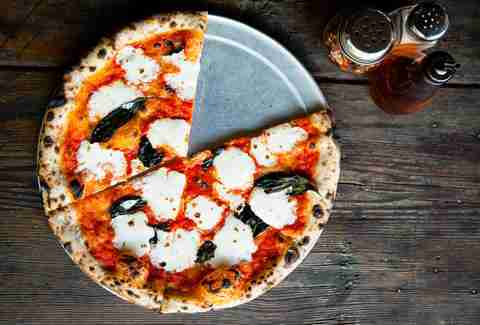 And Roberta’s, the definitive winner in our experts-selected Best Pizza in New York competition, sure makes that. The perfectly chewy crust is thick enough to hold up to a deliciously intertwined pile of meat and veggies, but not so beefy that you can’t eat a whole pie yourself and seriously consider another. The pies rotate regularly, beckoning you back to see what’s up this week, and as long as you’re near the L train, you should probably heed that call. And again, not all the cars outside are on fire anymore. In 1914, after saving all the shekels from his Polish mushrooms and herring pushcart, Joel Russ opened his legendary establishment on the LES. In 1920, he moved it to its current spot on Houston St, where it still stands to this day, one century and four generations later, thank Moses. 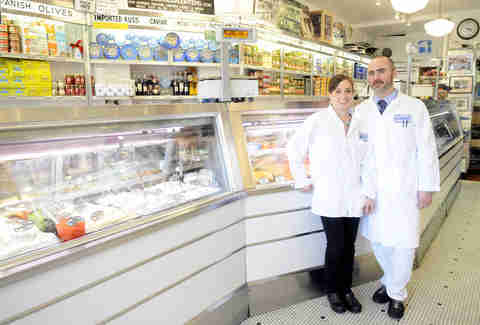 It’s known as an "appetizing" shop, which roughly translates to "things that you eat with bagels": smoked fish, caviar, and manifold other Jewish delicacies that they do better than just about anywhere else in the world. The selection of cream cheeses here alone could drive you mashugana, there’re over a dozen varieties of salmon (the belly lox and pastrami cured salmon shouldn’t be missed), and don’t forget the way-better-than-manna sandwiches, the most famous of which is the notorious Super Heebster: whitefish, baked salmon salad, wasabi-infused fish roe, and horseradish dill cream cheese. To complete your Jewish soul nosh, jump on some rugelach, and wash it down with an egg cream. You’re welcome boychik! 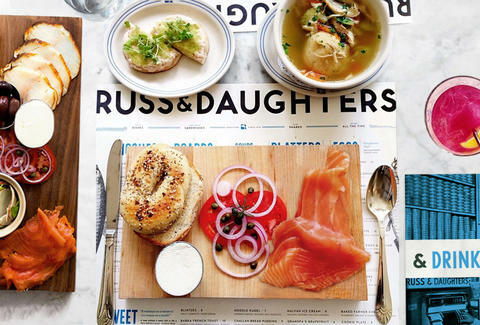 After all these years, as seemingly every part of the the Lower East Side neighborhood shifts and bends and shines itself up, Russ & Daughters remains. And so do I, on its line, still finding myself becoming verklempt while eyeing that fish counter. Back when there was only one Shake Shack, meat-adorers from around the city gladly stood an for hour in Madison Square Park, waiting for cheap, perfect cheeseburgers. Today, they still wait that hour, despite there being nine other locations with (comparably) regular-length lines in New York City alone (plus the Abu Dhabi spot, but that’s a little far). 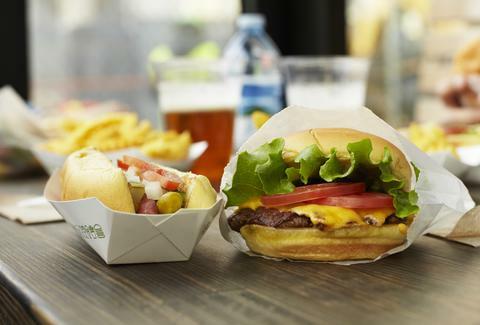 Seems like Shake Shack's doing something right. Like those burgers, obviously. The thin patties, in a time of ever-escalating NYC burger warfare leveraging funky blends and aging and consuming hype, are from a simpler age -- when “basic” didn’t imply you wore Hunter boots, and it wasn’t mutually exclusive with “fantastic”. They have wildly innovative things like “bacon” on them. The secret Shack Sauce might be the ketchup and mayo you whipped together as a kid (plus, like, some other stuff), and that couldn't be more ideal. The Martin’s potato buns, like everything else, are understatement perfected. And then of course, you’ve got the shakes, and the almost-literal Concretes, and the all-beef, split hot dogs that started the damn whole thing. Yes, Shake Shack is an empire: you can buy its cheese fries (thank god the crinkles are back) in Moscow, and pieces of its ownership on the New York Stock Exchange. But it’s the people’s empire. The ingredients are as fresh as you could ever hope for from a culinary monster of this scale, the service is notoriously friendly, and nothing ever seems too big about it. My buddy used to work near the park, and when he remembered that he liked me for whatever reason, he’d grab burgers on his way over. One time he got held up en route; the burger was maybe an hour old by the time he showed up -- not even close to hot. It was still probably the best thing I ate that week. One of the hardest tables to snag in New York City is still at April Bloomfield and Ken Friedman’s hit West Village gastropub. More than a decade in, daily lines continue to form outside the raucous corner hangout, the original champion of the now ubiquitous no-reservations rule. Everybody waits, whether you’re a neighborhood regular, fanny pack-toting tourist, or certified celebrity. 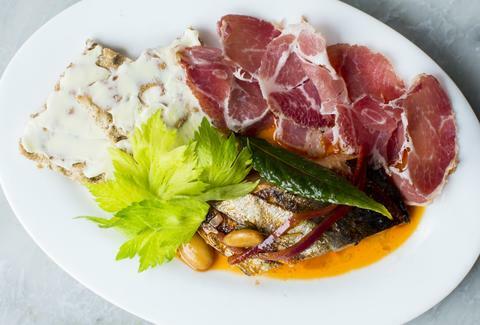 Ever since a former music exec teamed up with a British-born chef in 2004 to open perhaps the city’s first gastropub, countless chefs and restaurateurs have tried to replicate the concept, but few have reached the Spotted Pig’s level of Michelin-starred success. Bloomfield’s strict but consistent style is key (don’t even think about asking for substitutions). Dinner after dinner, we find that the gnudi is always pillowy, the Roquefort-topped burger is always grilled to juicy perfection, and the roll mops -- wrapped pickled herring topped with creme fraiche -- are always just briny enough. And waiting outside a bit for any of it is totally, totally fine.